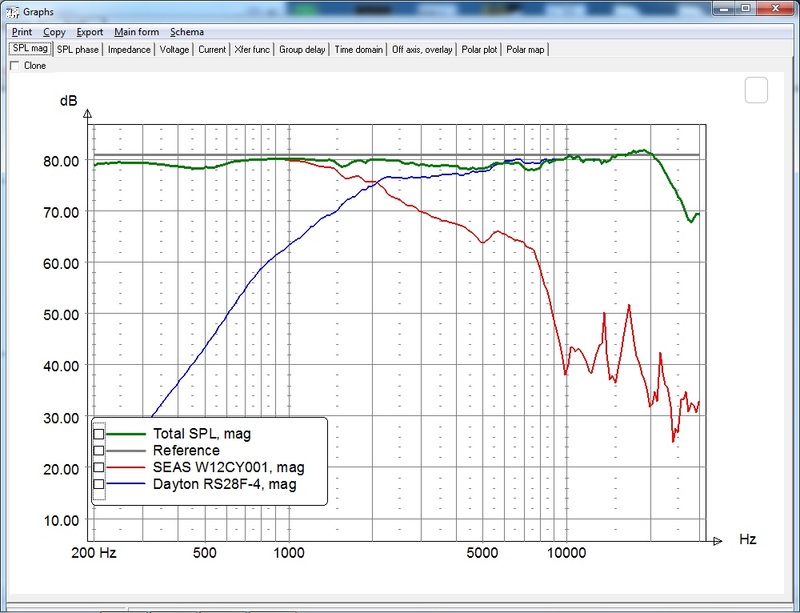 I have released new driver unit measurements on the L12RCY/P used in the “Prestigious Two – Mini Monitor” loudspeaker. “Prestigious Two – Mini Monitor” is a less expensive alternative to the “Excellence Two – Mini Monitor” design. The SEAS 4.5” mid-woofers used in these two designs are more alike than different from each other. The L12RCY/P has 1-1.5dB higher sensitivity and the cone break-up occurs at a lower frequency, 9.2kHz instead of 10kHz for the W12CY001. The W12CY001 also has a bit lower distortion profile and a greater bass extension. Besides that they are very similar drivers. Read full article |Comments Off on New driver unit measurements! Excellence Two – Mini Monitor Construction Update7! As in real life, loudspeaker building can take a sharp turn and the Excellence Two – Mini Monitor is no exception. When I listened and tested the loudspeaker with my DEQX in an active setup it sounded fantastic. It worked best when I used a 48dB/octave linear-phase cross-over with a cross-over point between 1750-2000Hz. With that in mind I started to design and build a first prototype of the cross-over with steep cross-over slopes (4th-order LR, acoustical) and with a cross-over point around 2-2.1kHz. Everything was looking good, both frequency and distortion measurements, but something was missing…. Yes, the loudspeaker sounded good, but the magic was gone! I used a “Sledgehammer” Steel Laminate Inductor for the mid-woofer section of the cross-over in order to keep the inductors “DCR” as low as possible. I quickly swapped this inductor to a 12 AWG copper-foil inductor instead (expensive). The effect surprised me. Now the loudspeaker sounded much better. Some muddiness disappeared and the mid-range clarity was much better, but still no magic! 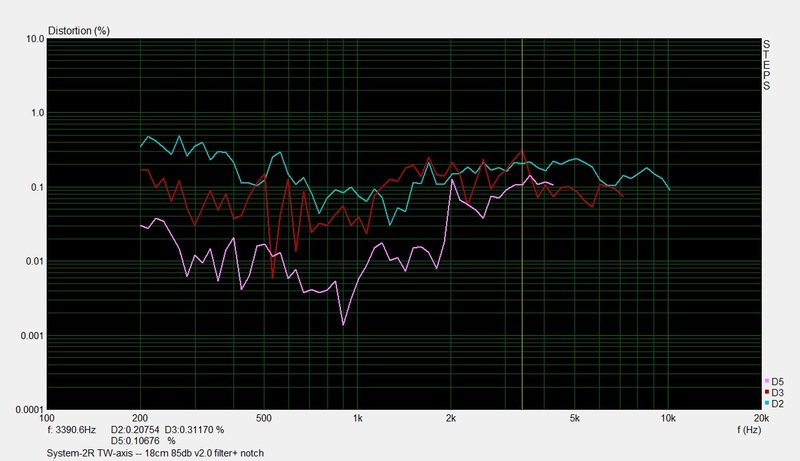 I expected more of these drivers after listened to them in the active setup. First of all, even though these “Sledgehammer” Steel Laminate Inductors have a good reputation they will never be used as a cross-over part in one of my designs. Perhaps they would work in the woofer section of a 3-way cross-over, but I would never use them in any mid-woofer or mid-range section of a 2 or 3-way system. They have poor sonic performance in my opinion and when using a high resolution driver as the SEAS Excel, they just don’t work in this design. What to do? Scrap the project……. Of course not! Back to the drawing table and build the v2.0 cross-over. Ok, a steep passive cross-over for the W12CY001 mid-woofer killed the midrange resolution and even though the cap shunt over the inductor technically worked in reducing the 10kHz cone break-up, it didn’t sound good enough. This time I simplified the cross-over even further. I used a single inductor together with a LC notch to reduce the cone-break-up at 10kHz. Now the acoustical cross-over slope is a 2nd order LR topology. The mid-woofer section has the same number of cross-over components, but the components connected in series with the signal path are reduced to one. That’s a good thing sonically. The tweeter section only needed a minor change to fit the new design. It was as simple as removing one cap and the new cross-over only needs 8 components to achieve the desired cross-over point at 2100Hz. The v2.0 cross-over consist of a single inductor (L1) and with the above mentioned LC (C1, L2) notch-filter for the mid-woofer section. The tweeter uses a single cap + inductor (C2, L3) and has a response shaping circuit ( C3, R2) in order to reduce the tweeters rising top-end. The single resistor (R1) is used to attenuate the tweeter level to an appropriate level and personal taste. The cross-over is an asymmetrical filter design with a mid-woofer acoustical 2nd order topology and a tweeter 3rd order topology. The asymmetrical filter design together with the relative acoustical off-set between the mid-woofer and the tweeter makes a perfect acoustical 2nd LR cross-over filter with a 180deg phase shift at the cross-over point, which means that the tweeter must be connected in reverse polarity. A tiny bit higher distortion numbers compared to the v1.0 cross-over, but it’s still very low. The notch-filter reduces the cone break-up by 25dB. The “knee” between 5.5kHz and 7.5kHz are smaller in the far-field measurements and isn’t as pronounced in the off-axis measurements. Read full article |Comments Off on Excellence Two – Mini Monitor Construction Update7! Excellence Two – Mini Monitor Construction Update6! I’ve built the first prototype (see my last post) of the cross-over and made some distortion and mid-woofer near-field frequency measurements with the focus on the cone break-up behavior. 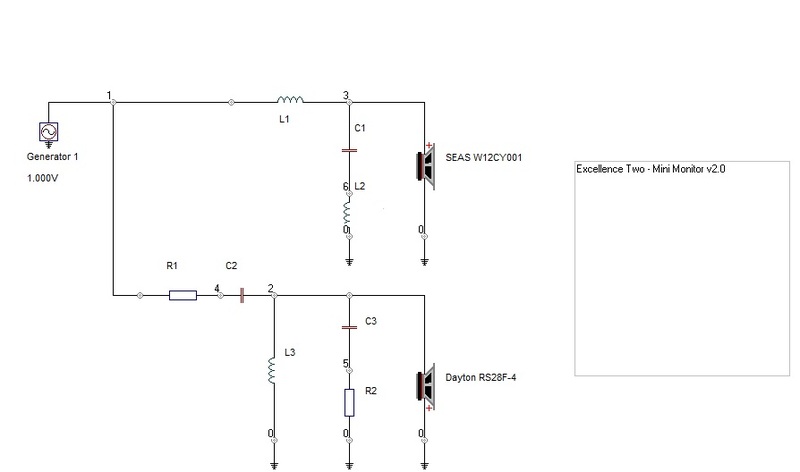 The mid-woofer cross-over section is made of a simple 2nd order electrical filter in order to achieve a 4th order LR cross-over slope with a cross-over point at 2000Hz. For the notch filter section a cap shunt over the series coil is used to reduce the cone break-up at 10kHz. In order to simplify the cross-over and to get a more accurate notch filter, I choose the cap shunt instead of the LCR notch filter type. A cap shunt connected across the coil and in series with signal path, requires a high quality component in order not to degrade the sound quality. Thanks to the relatively low cross-over frequency, the odd-order distortions are low, even at higher listening levels. There isn’t a huge difference in the distortion measurements between using a notch filter or not for the mid-woofer cone break-up. 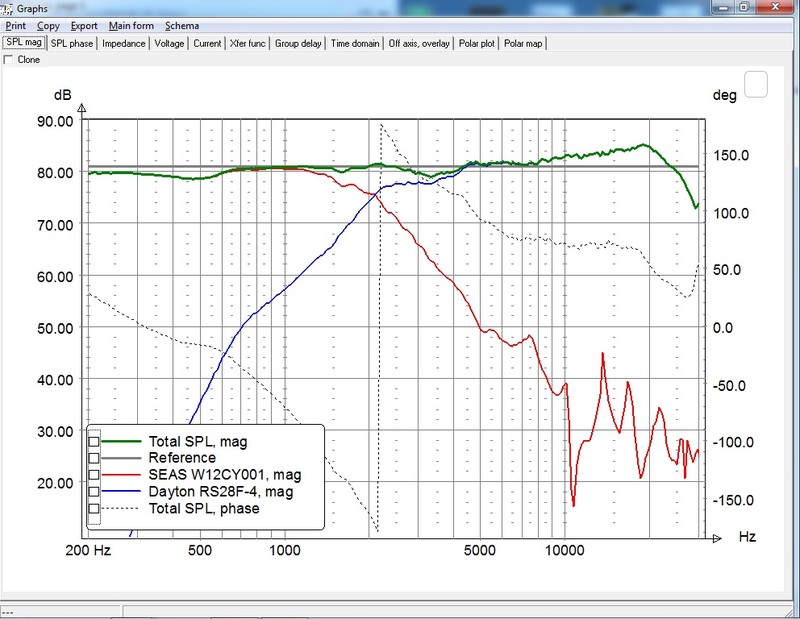 Don’t be fooled by the distortion measurements alone, the cone break-up is very audible and a notch filter is a must. The notch filter reduces the break-up with an additional 15dB and the effect is clearly visible in the frequency measurements. A brief listening test to the prototype cross-over suggests that some work needs to be done at the tweeter section in order to find the proper balance between the mid and highs and the tweeter level. For the mid-woofer cross-over section I want to use a coil with as low internal resistance as possible. I will test and listen to both iron-core and copper-foil coils to determine the best choice for the design. Left picture: Cross-over version 1.0 with mid-woofer notch filter – 85dB level. 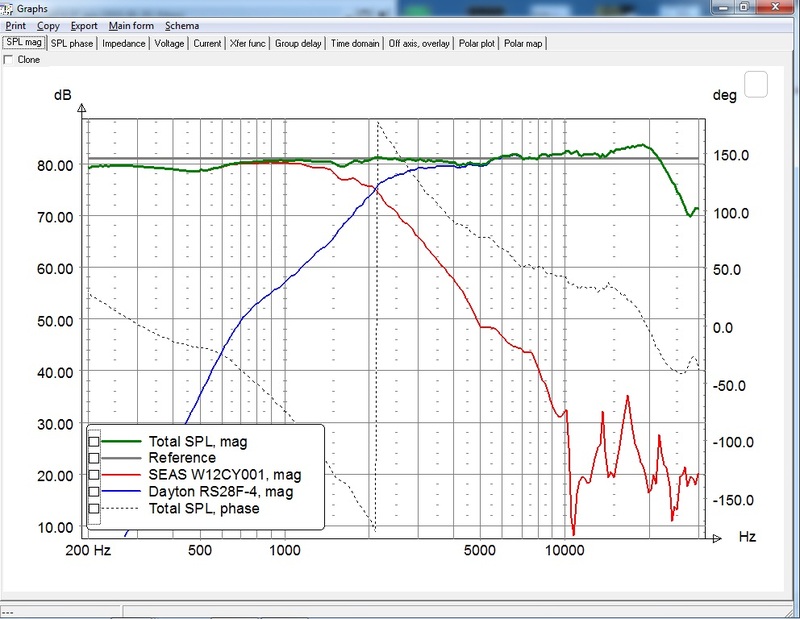 Right picture: Cross-over version 1.0 without mid-woofer notch filter – 85dB level. Blue = 10cm near-field measurement without notch filter. Red = 10cm near-field measurement with notch filter. Read full article |Comments Off on Excellence Two – Mini Monitor Construction Update6! Excellence Two – Mini Monitor Construction Update5! I’ve begun with the cross-over simulations based on the frequency measurements I did last weekend. So far everything is going well and it was quite easy to simulate the first prototype cross-over design, which I will build, measure and listen to. There are a couple of challenges to deal with in this design. First of all the mid-woofer cone break-up needs to be taken care of properly. I will use steep cross-over slopes (24dB/octave acoustical) and a notch filter to reduce the 10kHz break-up mode. I’m not fully satisfied with the conventional LCR notch approach, instead I will try an alternative method to deal with the break-up and to reduce the complexity of the filter. Distortion measurements and listening tests will decide which method I will use. Second, I have to deal with the tweeters rising top-end response and how much attenuation it needs in order to get a well-balanced sound that doesn’t sound to bright, but still manage to present an open and airy sound. The 1m measurement indicates that the mid-woofer relative acoustic off-set is approximately 25mm (1”) compared to the tweeter. 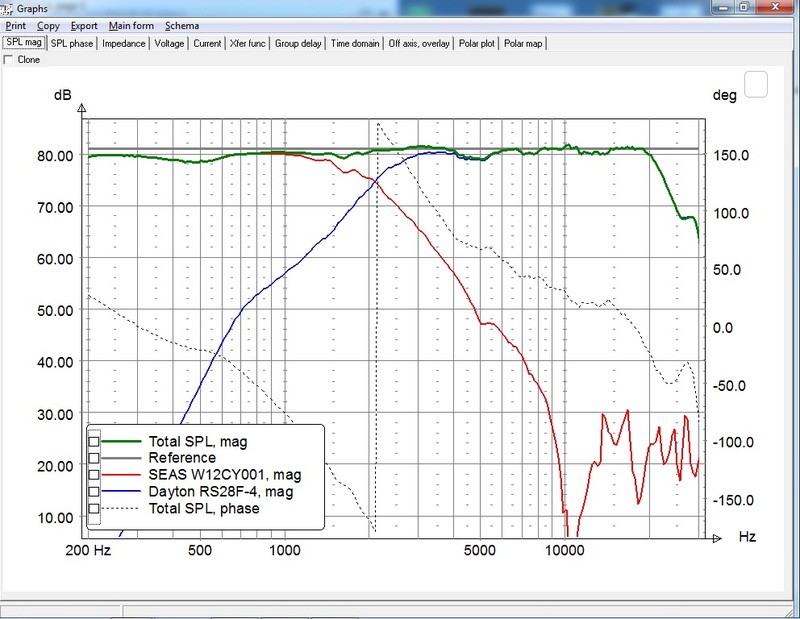 The cross-over simulation is optimized for the 15deg off-axis measurement and at a 2.5m listening distance. 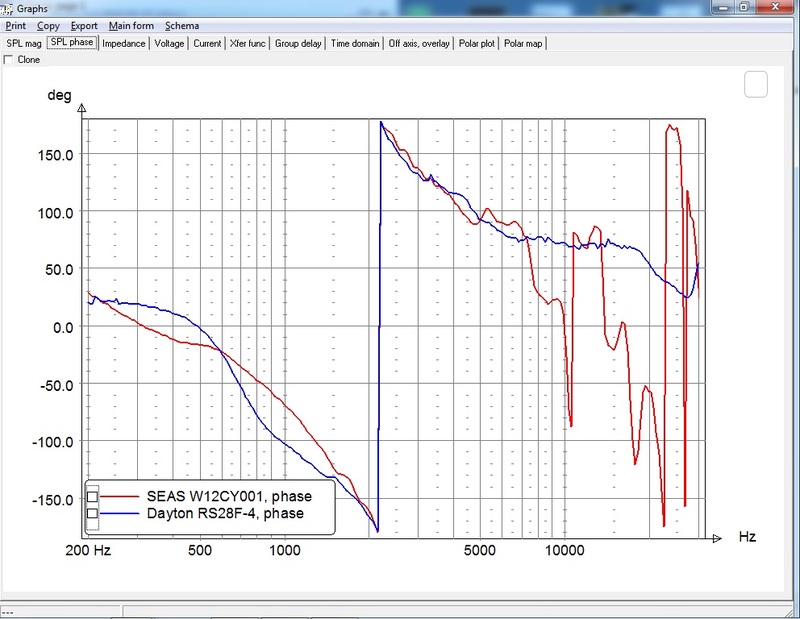 As can been seen I’ve used almost a full baffle-step compensation and the sensitivity is about 81dB 2.83v/1m. Not exactly a high sensitivity design, but as expected when using such a small mid-woofer for woofer duties and not only for mid-range duties. The mid-woofers cone break-up at 10kHz is well suppressed and the 13.5kHz and higher break-ups is suppressed by 45-50dB and should be off the audible radar. The cross-over frequency occurs at 2100Hz and the phase integration between the mid-woofer and the tweeter is superb. The tweeter has a rising top-end at the 0deg, on-axis frequency response and it’s still visible from 15kHz at the 15deg off-axis frequency response. Listening tests will decide if the tweeter needs more attenuation. Personally I like when the on-axis response has a somewhat rising top-end, since it often contributes to a greater 3-D perspective and soundstage. However, to avoid an overly bright sound characteristic this calls for a non toe-in loudspeaker setup. Read full article |Comments Off on Excellence Two – Mini Monitor Construction Update5!